Earlier today, EconetHealth, the health services subsidiary of Econet Wireless launched a new product called EcoHealth Tips at a ceremony attended by various stakeholders in the health sector including officials from the Ministry of Health and Child Welfare. The new offering provides health related information via USSD to subscribers who sign up for the new feature on their Econet lines. The service can be accessed by dialing *300# and following the prompts after. For 5 cents a day EcoHealth Tips subscribers will receive a daily tip in line with the category that a subscriber chooses. Categories currently available are Live Well, Lose Weight, Stress, Women’s Health and Diabetes. The Deputy Minister of Health and Child Welfare, Dr Paul Chimedza, who was the guest of honour at the product launch applauded Econet’s involvement in the community through the launch of relevant products that improve the lives of Zimbabweans. He welcomed partnerships that aided in health care delivery including tech solutions that give access to information necessary to combat health risks. Officials from Econet who included CEO Douglas Mboweni and the head of EconetHealth Dr Lunga spoke on the benefits the service will bring in integrating technology to health delivery and the opportunities that are being explored to effectively use information gathered by the services. 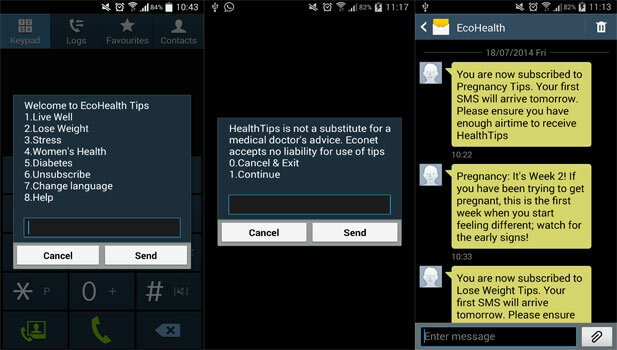 EcoHealth Tips marks the latest in health related services that Econet will be launching. Previously the MNO had significant success with its Energise The Chain initiative that focused on energy solutions for vaccines. According to Econet officials EconetHealth shall be launching another product that ties in with EcoHealth Tips within the next 90 days. What are your thoughts on this new service? How much of a difference do you think it will make in the lives of its users? 5c a day is only $1.50 but really am I getting anything at all that I can not get already on facebook? Facebook lets face it has everything, from what to watch on tv, whats showing at the movies, romance, current affairs, consolidated news etc. Thats just me though. I’m a bit lost here, what’s your definition of USSD hack? How much money is this seriously going to make econet, instead of trying to take every tiny idea why don’t they allow their USSD platform to be used by NGOs or startups who can really benefit from creating such a service. It is embarrassing that a company the size of econet thinks this is a achievement and are willing to actively block startup innovation so they can monopolise this sort of content. @munyar, what did they steal from you. They do this everyday. Maybe we should start a community petition. Not necessarily to get monetary compensation but to get the word out there. Masiiwa should also be made aware on what his guys in Zimbabwe are doing, that is if he does not know already. He knows. He knows how Econet is performing, what products are launched, services rendered, etc. No pulling anyone down here. But ever heard a proverb about teaching how to Fish? Econet is killing the Developer community. This is not innovation at all and I can assure you, no significant money is going to come out of this service, not by Econet Standard. This idea seems like something that they could have offered local developers to come up with a solution and gain some recognition and experience in doing so. That way, they are giving back to the community through teaching. Not through ‘stealing’ or ‘innovating’ this very small idea. How do you not get this? My comment is from someone based in Namibia and I understand what most people are saying about opening up platforms to developers. MTC (Econet equivalent here) has decided to take a different approach, they opened up everything to developers like us to create these kinds of simple “USSD hacks” as somebody called them. MTC themselves rarely launch these kinds of products because they left it to developers to innovate and create brilliant solutions on their own. This means innovation and ICT grows because of an enabling environment. What Econet is doing is stiffling that innovation. I’m not the type to cry about stolen ideas, ideas are infinity. Everywhere I turn, I see a potential idea waiting to be developed. But the real argument here is not about stolen ideas. The question is, is Econet doing enough to support local talent? I think Econet is killing the local developer Community! When you are a big brother in your family, it doesn’t give you the right to grab all the food and starve your minors just because you are stronger and can eat faster. The idea is to create a more sustainable tech environment. When you think of it carefully, you will realize that it’s actually to the benefit of Econet for it to create an enabling environment for developers. Because that would spur a vibrant developer ecosystem in Zimbabwe. Once you have that ecosystem, you will have a stronger and more exposed pool of local talent and eventually, there won’t be any need to outsource “doable” projects to Comviva and some such other Indian based companies. To eliminate risk is easy, empower the local developers! You empower them by letting them do ‘small’ projects like EcoHealth. In time, you will have confidence in them. Now when you do every small project by yourself, how do you expect the small guys to learn? Econet never misses a chance to make money off people… they tell you the ebola information is free and make out like they are doing the public a service, but the only people they are serving is themselves! to get Ebola info you have to sign up for Health Tips for which they charge for every message you receive, which they sometimes truncate to maximize charges, so tell me what is free? They do not make it easy to unsubscribe either and by the time you get all the ebola info, you could have already died from the virus! Econet money grabbing captilasts!